When our spelling is perfect it's invisible. But when it's flawed it prompts strong negative associations. An environment of frequent purposeful writing provides numerous opportunities for teachers to help students discover more about spelling words. Learning to spell is not a matter of memorizing words, but a developmental process that culminates in a much greater understanding of English spelling than simple relationships between speech sounds and their graphic representations. Read more about spelling & word study! Spelling and word knowledge are building blocks for effective written communication. To ensure that students go beyond simply memorizing word spellings, teachers can build students' knowledge of English spelling patterns and spelling strategies. Doing so will allow children to spell many more words than memorization alone. Model and provide practice on using new words in sentences. 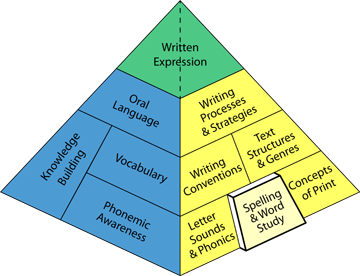 Teachers can help students become proficient spellers by teaching word analysis and spelling strategies systematically. This includes teaching spelling patterns and spelling strategies like identifying prefixes and suffixes. Games can be used to support students in memorizing the spelling of common, irregular words like "the," "of," and "I." One of the best ways to assess students' spelling skills is to observe their writing. Teachers can observe whether students represent all of the sounds in a word, spell high frequency words correctly, and display familiarity with the spelling patterns and word families taught in class. It is important to have reasonable expectations based on the student's grade and individual ability.